Phaansi features Shashi Kapoor circa 1978 at the height of his...I was going to say "powers" but really it's his lovely curls and big eyelashes. Head-to-toe peach is not acceptable on anyone, not even Shashi Kapoor. 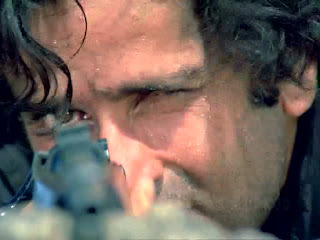 He plays a sort of character I haven't seen him do before: a sort of heroic lone gunman who growls, sweats, and shoots more than he grins and woos. 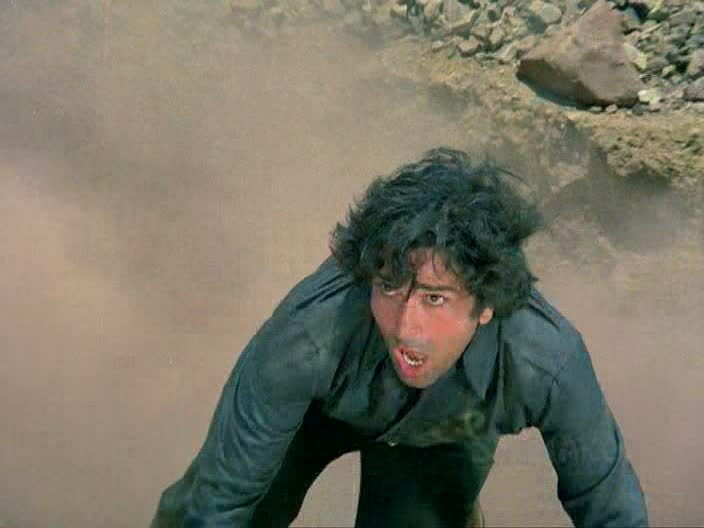 on a mission to take down a gang of dacoits led by Tilak Singh (Ranjeet), who killed his father (Iftekhar) and sister. 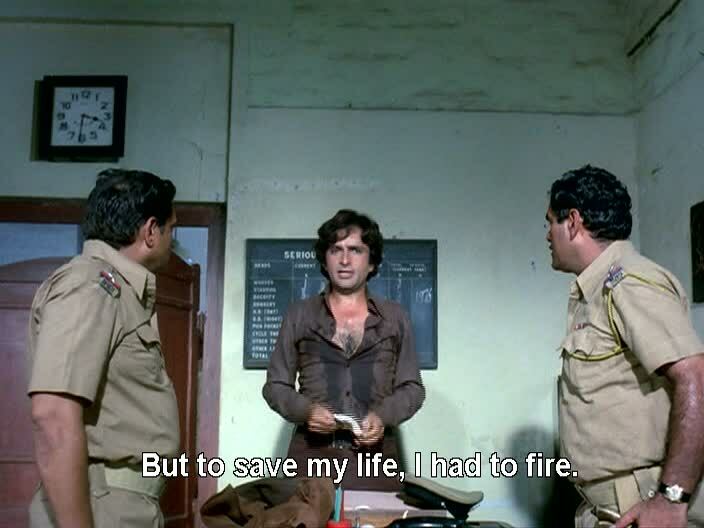 Raju eventually gets backup from some other officers but it's mostly him stalking the gang members, aided by reformed legendary daku Himmat Singh (Pran) and thwarted by completely creepy informant and perv Lala (Jeevan, sounding even more ridiculous than he usually does—is that nasal tone his actual voice?). 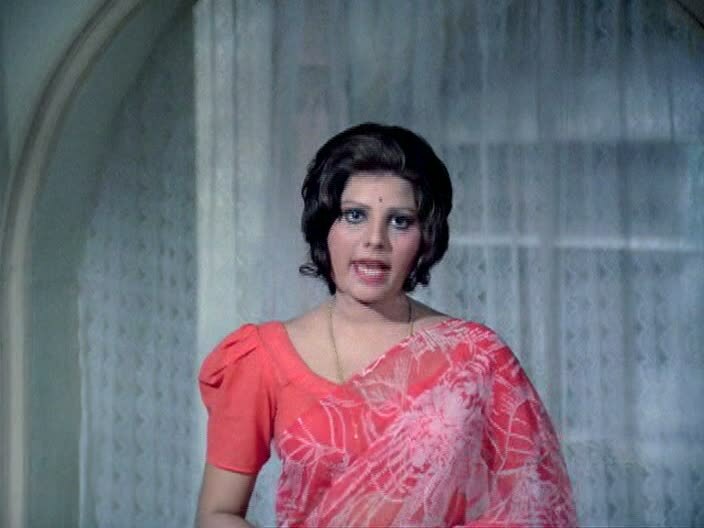 It's not a happy movie, and grinning and wooing would have been out of place anywhere other than the few brief interludes with long-time sweetheart Chhaya (Sulakshana Pandit). While Shashi's performance was passable, it didn't quite convince me. Maybe I'm just so accustomed to seeing him as law-abiding that I couldn't imagine him dallying with vigilantism. Phaansi is one of the dozen films he had release in 1978, and he does not bring his A-game to this one, apparently having saved that for Trishul, Satyam Shivam Sundaram, and Amar Shakti. 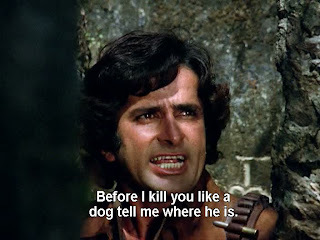 He's better in the first two songs ("Jab Aati Hogi Yaag Meri" and "Bachchiyan Jawan Te Boodhiyan")—bring on the puppet moves!—which both also feature flirting with Sulakshana than he is snarling lines at Ranjeet. It's not that Shashi can't snarl effectively—see Junoon, for example—but I think introducing him as a sunny loverboy and then lurching into enforcer after tragedy strikes his family doesn't quite work here. Interestingly, he can do it the other way around, as in Ganga aur Suraj (also with Sulakshana Pandit) where he's a rifle-toting badass from the get-go and then reforms. It's easier to imagine someone like Dharmendra, Vinod Khanna, or Amitabh Bachchan doing better at this particular mix of canoodling and vengeance. 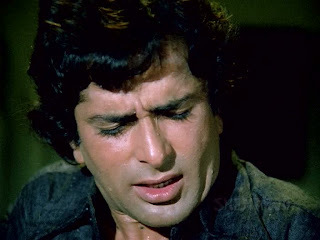 Don't cry, Shashi. I still love you. This being a daku and rifles movie, there is much good work contributed by shots and camera angles with scenes of people peering from behind rocks or hiding among trees and old buildings; I mention them in conjunction with Shashi because he's the primary beneficiary of them. As Raju strides through the wilderness on the hunt for Tilak Singh, there's a lot of time spent on establishing the idea of "just a man and his gun." 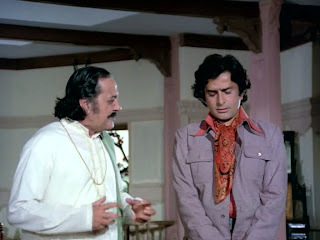 The way Shashi is shot in this film adds as much to the character as he does himself. In fact, Shashi is really the only significant problem I have with this film. (Wow, I never thought I'd hear myself say that.) 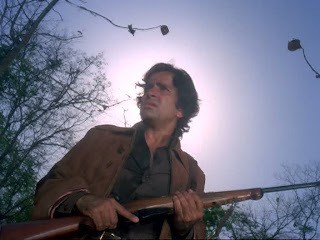 Director Harmesh Malhotra, who also did the excellent Gaddar (discussed at length in this episode of Masala Zindabad) with many of the same people, and writer Ravi Kapoor (Ashanti and Sheshnaag, among others) have created a good story with several interesting characters representing many different shades of evil. It's not just "good vs. bad"—there's a lot more to it than that. The hero himself is not exactly perfect, and the lovely idea of reform and change is embodied by the person to whom this film truly belongs: PRAN. 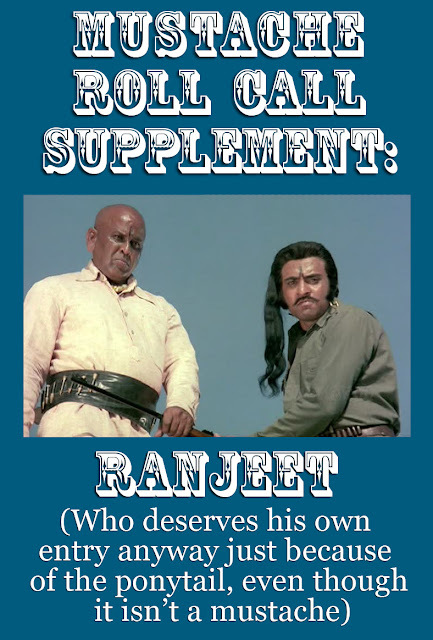 Pran is so amazing in this film that he manages to talk Ranjeet and his whole crew of baddies (including Shetty, who has more lines in this film than in all the other movies I've seen put together) out of murder! HE PREVENTS CRIMES WITH HIS WORDS. He has decided on some principles and lives by them. He inspires other people to think about their own ethics. He constantly examines situations to assess the action that leads to the greatest good. He is weary yet committed, solitary yet community-minded. 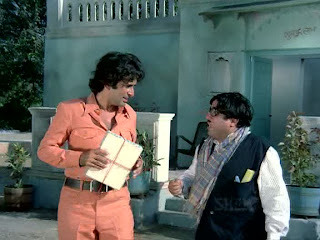 This character is fascinating and Pran does a brilliant job giving Himmat Singh strength and nuance. 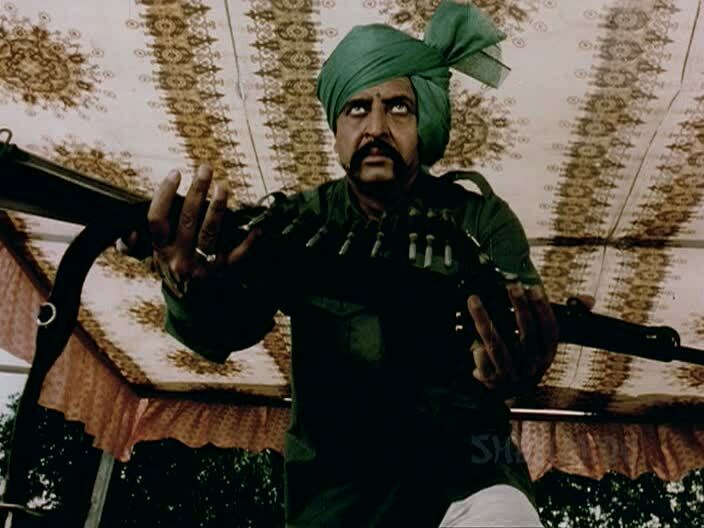 I cannot leave this film without saying how stupid Sulakshana's character is. Chayya is the type of woman who even in this rough-and-tumble daku world usually (though not always, notably) sits and whimpers while men do the dirty work, some of which is a direct result of her foolish decisions. I wonder if she is meant to be considerably younger than Sulakshana is, as Chayya's actions make more sense for a teenager than for a young woman. "Throw self on bed and pout" is a behavior I associate with Jan Brady. However, I applaud her hallucination of her wedding night. It's not as good as Rakhee's in Sharmeelee, but then again, what is! She also has some fun clothes, namely this coral sari and puff-sleeved blouse. And speaking of clothes, how much do you love this neckerchief? To close: it is with great happiness that I discovered that my viewing of this film coincided with Dolce and Namak's Movember Filmi Mustache Party. This is a very mustachioed film. Only two of the dozens of male characters don't have one. Vote for your favorite in the comments! I am not pleased with the lack of punctuation here, but it's too late at night to open Photoshop up again. For more on Phaansi, enjoy Memsaab's post, complete with a more thorough plot summary and lots of good comments. If this were Facebook, I would "like" this post. The moustache vote...definitely Shashi's disguise mouche. Fabulous! Thanks for the warning, Beth. I think I may just go check out Sharmelee first. Despite the luxuriant curlage, I think I like his look in those pics better. 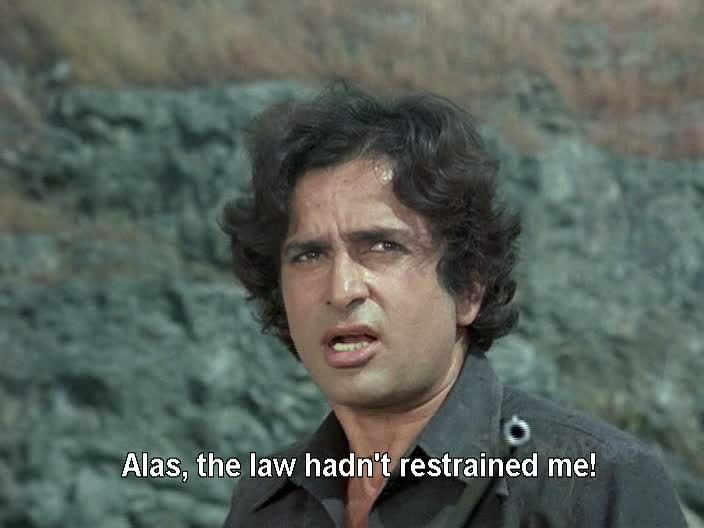 But, I will say, Shashi sure looks the most like his father, doesn't he! One or two pics are just dead on to his dad's look in that Alexander movie he did in the '40s! WHERE IS RANJEET, MY RANJEET, IN YOUR MUSTACHE ROLL CALL? 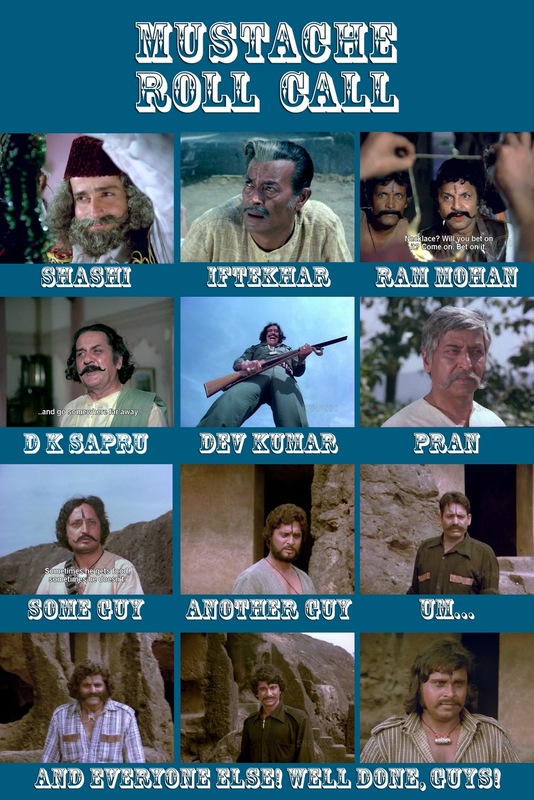 amazing collection of mustache pics.. Ranjeet's pony took the cake!